4th Black Week Istanbul Festival will be held with the theme of Mike Hammer on 23-24 November. But what is the Black Week Festival? The Black Week Festival is an event that combines various cultural city activities related to crime fiction literature and is celebrated in different cities around the world with similar names. 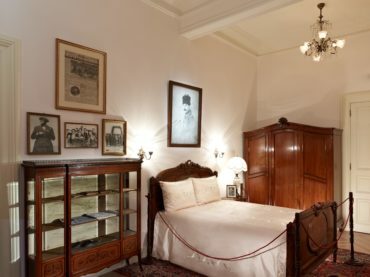 The festival, which is known as “Novela Negra” in the cities of Barcelona and Buenos Aires, was held for the first time in Turkey between 22-24 October 2015, on the 125th birthday of Agatha Christie, the “queen of the detective novel.” Being listed among “The 8 Best Hotels of the World for book lovers”, Pera Palace Hotel has announced to organize the 4. Black Week Istanbul Festival and it will be celebrated with the participation of local and foreign detective writers. Ahmet Ümit, the famous Turkish crime writer, described the event as, “The Black Week, which is an expression of the relationship between city and literature based on crime, contributes to the promotion of cities by bringing together the writers living in different parts of the world.” The Black Week Istanbul Festival will be held for the 4th time this year at Pera Palace Hotel, a place that distinguished with its unique place in the world of literature as well as its deep-rooted history! If you wish, we should briefly mention this special event for the fans of crime fiction literature. When is the 4th Black Week Istanbul Festival? 4th Black Week Istanbul Festival will be held on 23-24 November under the sponsorship of Denizbank. ​Where Will the 4th Black Week Istanbul Festival Be Held? The festival will take place at the Pera Palace Hotel, which has been listed among “The 8 Best Hotels of the World for book lovers,” and also hosted crime writer Agatha Christie who has an outstanding name in the crime fiction literature. What will be the theme of the 4th Black Week Istanbul Festival? In the previous years, the festival was organized for the honor of Agatha Christie, Georges Simenon, and Ian Fleming. The theme of this year’s Black Week Istanbul Festival will be the legendary crime fiction character, Mike Hammer. Which authors will participate in the 4th Black Week Istanbul Festival? Pera Palace Hotel, which stands out with its contributions to culture and art life with its deep-rooted history, will be hosting this event which will be held on 23-24 November. Among the guests who will participate in the festival is world-famous author Wolfgang Schorlau and BA Paris, an internationally acclaimed crime fiction author. In addition to international guests, renowned Turkish crime fiction authors such as Ahmet Umit, Armagan Tunaboylu and Celil Oker, and also the Union of Turkish Crime Fiction Writers will partake in the festival. What topics will take place at the 4th Black Week Istanbul Festival? Pera Palace Hotel’s Galata Hall will host crime fiction enthusiasts at the 4th Black Week Festival in some sessions such as, “What is Mike Hammer? What is not?”, “Current Affairs, Politics and Crime Fiction”, “How to Write the Crime Fiction?”. What is the entrance fee for the 4th Black Week Festival? Let us explain, for those who wonder what the entrance fee for the 4th Black Week Festival is; All events in the Black Week Istanbul Festival will be open to the public and free of charge, and all details about the events can be shared on social media with the #blackweekturkey hashtag. If you are a true crime fiction enthusiast, counting days for this special event, we will be waiting for you at Pera Palace Hotel on 23-24 November. After explaining the Black Week Istanbul Festival, let’s introduce the event program of the festival, which will be held for the fourth time this year. Here is the 4th Black Week Istanbul Festival event program. 15:00 WHAT IS MIKE HAMMER? AND WHAT IS NOT? 15:00 CRIME FICTION NOVELS? OR CRIME FICTION STORIES? Important Note: All events will be held at Pera Palace Hotel. If you wish, you can also make reservations to all activities by calling this phone number: +90212 377 40 00! April 23 National Sovereignty and Children's Day is the national holiday of the Republic of Turkey, for 99. With the end of winter, the concert season starts in Istanbul. In recent years, with the addition of new. With the spring approaching, the wedding season starts. Many couples prefer warm seasons like spring and. Bike started to be included in daily life in Istanbul. But it is still not fully integrated. Still, many.